SB 277 Mandatory Vaccinations VACCINE SAFETY? Dr. Helen Ratajczak, a former pharmaceutical senior scientist has done what no one else has yet to do. 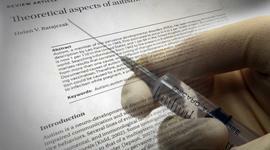 She reviewed the body of published science since autism was first described in 1943. One factor that she examines is the fact that the massive increase in autism rates (once calculated at 1 in 10,000 and today estimated to be 1 in 88) coincides with the introduction of human DNA from aborted fetal cells which have been a standard ingredient used in 23 vaccines since 1995. Ratajczak explains that this DNA incorporates itself into the DNA of the vaccine recipient--especially neurological tissue--and the body's immune system now attacks these altered cells as foreign invaders (no different than if it were attacking a bacteria, a virus or even a transplanted organ). "Now you have a body killing it's own brain cells...It doesn't stop, it continues through the life of that individual." It's hard enough to get all those connected to BigPharma money--University researchers addicted to endowments, Mainstream media addicted to drug ads, CDC & FDA officials hoping for post-government employment, and politicians who rely on campaign contributions--to even consider the evidence but the evidence exists and perhaps may also be a reason why in addition to the ever increasing rates of Autism we have more childhood auto-immune diseases, more diabetes, more learning disorders and behavioral issues then ever before in our history. For the most technologically advanced nation on the planet, for the country that spends the most on health care, for a nation that is the most vaccinated when it comes to overall health we rank amongst the lowest of all industrialized nations and amongst the highest in infant mortality.